Add some drama to your dining room with the contemporary Benecio dining chair. Finished with a durable and easy-to-clean 100% polyester fabric cover, this upholstered chair has a rich, velvety feel that adds a sophisticated twist to your home furnishings. Featuring a sleek ribbed design and clear acrylic legs, this comfortable chair has a modern feel with standout style. The timeless and neutral black colour is a fashionable way of updating any dining space and blends easily with existing dicor. Group multiple Benecio dining chairs around a table to create an elegant dining set, place them individually around your home as accent pieces, or use for extra seating when entertaining. This attractive and versatile chair makes a chic addition to any living space. 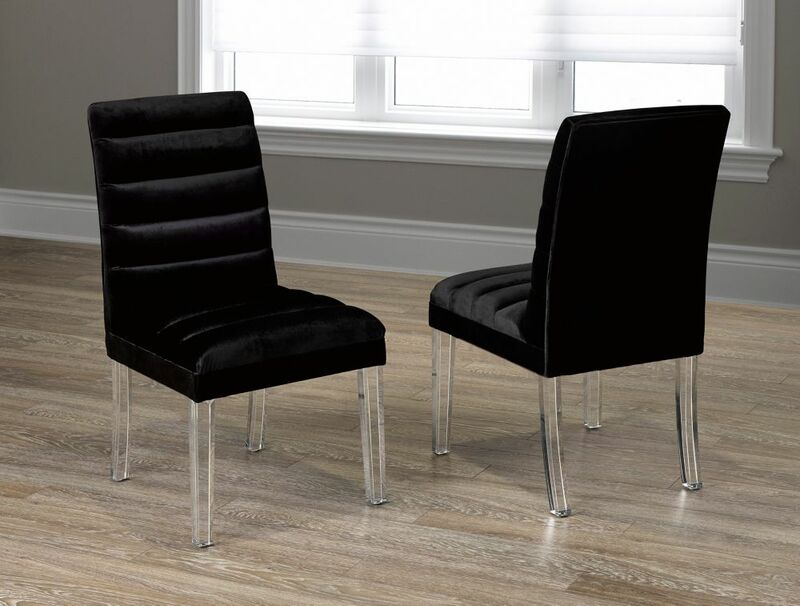 Benecio Dining Chair (Set of 2) Black Add some drama to your dining room with the contemporary Benecio dining chair. Finished with a durable and easy-to-clean 100% polyester fabric cover, this upholstered chair has a rich, velvety feel that adds a sophisticated twist to your home furnishings. Featuring a sleek ribbed design and clear acrylic legs, this comfortable chair has a modern feel with standout style. The timeless and neutral black colour is a fashionable way of updating any dining space and blends easily with existing dicor. Group multiple Benecio dining chairs around a table to create an elegant dining set, place them individually around your home as accent pieces, or use for extra seating when entertaining. This attractive and versatile chair makes a chic addition to any living space.